Logitech's first tablet-style universal learning remote incorporates both IR (infrared) and RF (radio frequency) wireless operation and includes a rechargeable battery and a docking station. Compared with other high-end tablet-style remotes, and like other Harmony remotes, the 1000 is Web-programmable and compatible with Windows and Macintosh machines. Say good-bye to cheat sheets. 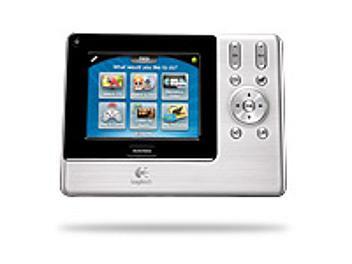 Everyone in the family can select what they want to do such as "Watch TV" and your Harmony remote does the rest. Adding favorite functions from an old remote is simple you just point it at your Harmony remote. Your remote recharges in its base station, so you won't be looking for batteries when you want to be watching TV. You connect your Harmony remote to your computer and you're guided through every step. If you hit a snag, customer support is ready to help. You can control your home-entertainment devices with one Harmony remote reducing clutter and complexity in your living room. You'll enjoy easy, one-touch access to any entertainment activity. You'll never get stuck because of a handy Help button that walks you through simple troubleshooting procedures. Support for 5000+ brands and 225,000+ devices, so you know it will work with what you have today and what you'll add tomorrow. See how your home-entertainment setup would work with Harmony.